These "capsicum drinks" were one of the first drinks I found after my doctor told me to avoid alcohol, and also one of the first drinks I got excited to recreate on my own. Capsicum is the family of plants that produce capsaicin, which is what makes chilies hot. These organic drinks by Prometheus Springs are a blend of natural sweetners, fruit juices, flavorings, and capsaicin. I tried both their Lychee Wasabi and Pomegranate Black Pepper Flavors. Although neither drink was very much like a "fruit juice," they did had a slight fruity flavor. Then the heat kicks in. Capsaicin is a flavor-neutral product, so these drinks don't taste particularly like a jalapeno or anything. They also just add a small amount of the capsaicin compound, so while these drinks are spicy and warming, they don't cripple you like drinking a bottle of hot sauce. I really like the invigorating flavor of these drinks, along with the spicy rush. But I didn't find the varieties very "distinct" from one another, they both tasted like a lightly fruity, modestly sweet beverage with a bit of heat on the finish. Although I was expecting something with a zestier intensity, I'd really recommend these drinks to anyone who likes "spicy sweet" flavors. I described them to Carla as tasting like "light, spicy lemonade," and that was the start of my plan of action. 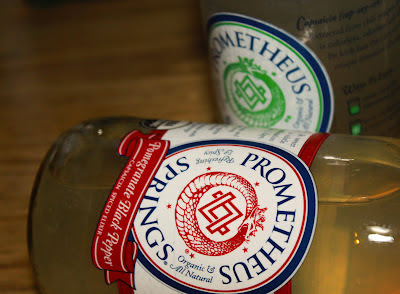 Pometheus Springs uses pure capsaicin, so they don't have chile flavors competing with their other flavors. Makes sense, but I thought you could enhance the fruitiness by using a fruity chile pepper, like a Red Fresno or Habanero. Not a strongly vegetable-tasting one like poblanos or thai green that would make your drink taste like the broth from a bell pepper. So I boiled up some honey in water and dropped in a roughly chopped habanero. This was a mistake. The boiling water and upward rushing steam atomized the chile's own capsaicin into the air, filling my face with a cloud of choking chile vapor. After I stopped sneezing (thankfully not into the drink), I added some lemon zest and let it infuse with the chile and honey for a few minutes. I then strained out the chile and zest and poured it into a half-gallon glass jug filled with lemon juice. Thinned out with a little water, it tasted great. The lemon was more forward that the honey, which is probably a good thing for a summer refresher. But it did have more heat that the store-bought variety.